Operating between St. Louis and San Antonio, two 14 car trains were ordered-proved so popular additional cars were added. Was at one time the most profitable streamliners in America. Jointly operated by the Katy and the Frisco. 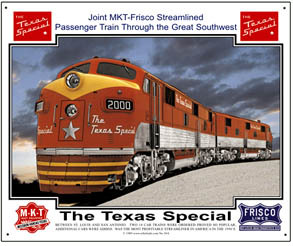 Presenting The fast and famous, Texas Special streamlined passenger diesel owned and operated jointly by the FRISCO and the KATY Railroads. At one time was the Nations most profitable passenger train. Operated between St. Louis and San Antonio. 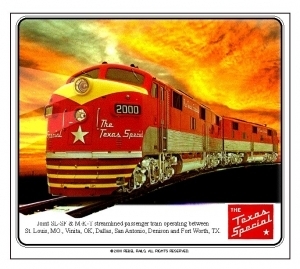 Beautiful Texas Special diesels were a joint operation of the Katy and Frisco between St. Louis and San Antonio. Two 14 car trains were ordered, so popular additional cars were added. Americas most profitable streamliner for several years. Beautiful Texas Special passenger E-unit diesels jointly operated by the Katy and Frisco. Operated between St. Louis and San Antonio. 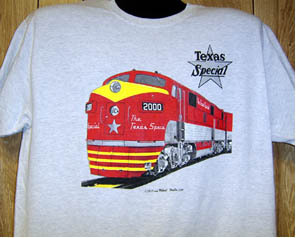 The beautiful Texas Special streamliner in its as delivered color scheme. Jointly operated by the Frisco and the Katy railroads. 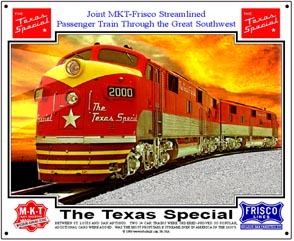 The beautiful, jointly operated by the Frisco and Katy Railroads, Texas Special passenger train diesels presented with blue sky background.